On Sunday mornings free parking is available in the small parking lot at the Carleton Street entrance (click on photo at left for a larger image). Almost all of the parking spaces on the West side - adjacent to the building - are reserved on Sunday mornings for blue "H" parking and are designated as such with removable "H" signs. One of these spaces is permanently labelled as an "H" parking space, and if you park in this space without an up-to-date blue "H" card properly displayed in your vehicle you run the risk of being ticketed and fined. 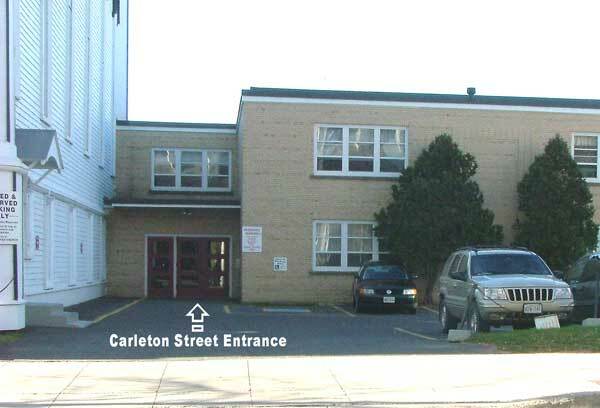 On Sundays, weekends and evenings (after 5:00 pm) general parking is also available on the Carleton Street (East) side of this lot; at all other times these parking spaces are rented and are not available for general parking. As well, next door to the North (the river side) Wilmot United Church has graciously been given permission to use the former location of Isaac's Way (now located on Queen street) for parking on Sundays and evenings/weekends. Further free parking on Sunday mornings is available at any of the metered parking spaces along Carleton Street, King Street and Queen Street, as well as behind (North of) the Library, next to the St. John River. In fact, Downtown Fredericton has many locations close to Wilmot Church where parking is free during evenings and weekends. There is also a parking garage on the south side (Brunswick Street) of Kings Place. It has been completely retrofitted, and is just a short walk from Wilmot United Church. If you wish to be identified as a Wilmot church supporter and therefore an authorized user of Wilmot's parking spaces, you may wish to purchase a numbered sticker for your vehicle's windshield which will identify your vehicle while you visit the church or take care of brief personal downtown business. Marlene has these in the church office and they are available at cost ($10.) to Wilmot supporters.